Jury selects designs for Capitol plaque to honor workers | Who Built Our Capitol? Jury members, (rt to lft) Michelle Manke - graphic designer and descendant of Capitol sheet metal roof worker Otto Manke; Chloe Beede - Owatonna middle school student and initiator of the petition drive that led to the bill authorizing the memorial; Don Mullin - Executive Secretary, St. Paul Building and Construction Trades Council; and Jack Becker, artist and founder of Forecast Public Art. After more than 100 years, the workers who built the Minnesota State Capitol, including six who were killed in the construction, will be honored in the statehouse. On Dec.15, a jury met to select designs for a commemorative plaque from among more than 50 entries submitted by sixth graders across the state. The two chosen designs, which will be used to produce the memorial, were created by Kalina Boubin of St. Mary’s School and Riley Kalbach of Willow Creek Intermediate School, both in Owatonna. The designs include a drawing of the Capitol dome and the names of those who died during its construction. A bipartisan bill, passed by the 2016 legislature, mandated the competition to create a memorial to honor all of the workers who built and restored what is considered to be one of the most beautiful and architecturally significant statehouses in the country. The bill was prompted by a 2014-15 petition drive and 2016 legislative committee testimony by Willow Creek intermediate School students in Jennifer Hansen’s sixth grade history class. 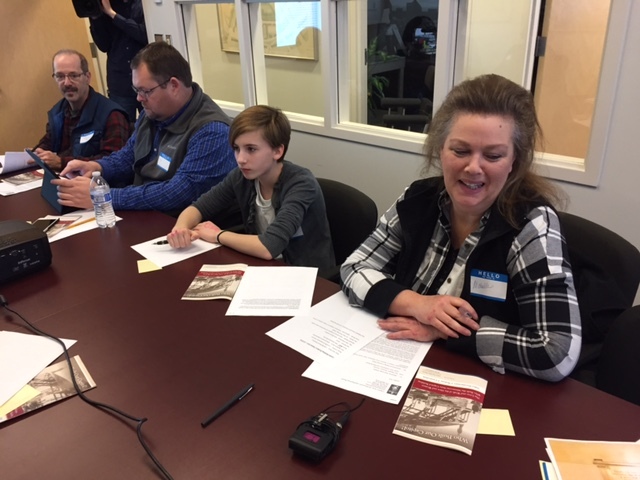 Hansen and Cannon Falls teacher Missy Klapperich, together with Labor Education Service project director Randy Croce, developed curriculum that inspired the students to ask why the original statehouse builders have never been publicly recognized. The lesson plans draw on primary historical resources and a documentary video featured on the Who Built Our Capitol? website, a special project of the Labor Education Service. The legislation authorizing the plaque was introduced by State Rep. John Petersburg, R-Waseca and State Senator Vicki Jensen, DFL-Owatonna, who visited the school and invited the students to testify. Petersburg served on the eight-member jury that selected the plaque designs, as did Chloe Beede, one of the leaders of the petition drive and a testifier at the legislature. Graphic designer Michelle Manke, whose great-grandfather installed copper plates on the roof of the Capitol in 1902; St. Paul Building and Construction Trades Executive Secretary Don Mullin and Forecast Public Art founding director and artist Jack Becker also served on the panel. Capitol Area Architectural and Planning Board Vice President Mary Ann Buck and Architectural Advisor Bryan Carlson plus Minnesota Historical Society Capitol Site Manager Brian Pease were also voting members of the jury that was facilitated by CAAPB Executive Secretary Paul Mandell. The CAAPB convened the jury and is charged with the final designing, production and placement of the plaque. The dedication of the memorial is scheduled to take place in conjunction with the restored Capitol grand opening celebration in August 2017.